KRAMATORSK, Ukraine -- Ferocious battles raged in eastern Ukraine on Friday, as Russian-backed forces launched a sustained assault to capture a strategic railway hub before a ceasefire comes into force on Saturday night. Members of the Ukrainian armed forces ride on armoured personnel carriers (APC) near Debaltseve, eastern Ukraine. At least 25 people were killed in an upsurge of fighting across the war-torn region on Friday, officials said, highlighting the fragility of the agreement negotiated by the leaders of France, Germany, Russia, and Ukraine. The violence, which erupted less than a day after a peace deal was brokered in Minsk, came as the United States announced the deployment of fearsome “tank busting” Warthog aircraft to deter Russia from further aggression. Twelve A-10 Thunderbolts and 300 accompanying personnel will be deployed to Germany by the end of February, Lieutenant-General Tom Jones, vice commander of US Air Forces in Europe-Air Forces Africa, said. The A-10, which saw service in Afghanistan and Iraq, is a slow-flying infantry support jet that packs ferocious fire-power. The aircraft will support ground troops deployed on “Operation Atlantic Resolve,” an American effort to reassure eastern European allies of Washington’s commitment to their defence and deter the Kremlin from trying a Ukrainian-style intervention in a NATO country. Ukraine is not a NATO country, but some experts have warned that the conflict there could escalate to a confrontation between Russia and the West if the peace agreement signed on Thursday fails. The worst of the violence is centred on Debaltseve, a strategic railway junction where up to 8,000 Ukrainian troops have found themselves to all intents and purposes surrounded by massed separatist forces. Russian-backed fighters, who have been advancing on the town from two sides for nearly a month, have launched a last minute bid to seal the encirclement and trap the town’s garrison before the ceasefire comes into force. 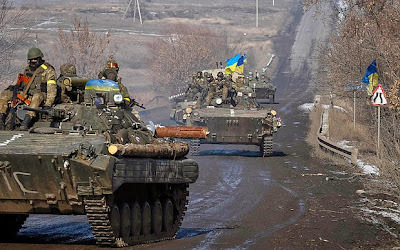 Fierce fighting raged at the village of Logvino, which controls the main road in and out of Debaltsevo, and on the eastern approaches to the Ukrainian held port of Mariupol, which separatist have in the past said they intend to capture. Meanwhile, at least one child was killed by incoming shells in Artemivsk itself - a town until now considered a relatively secure behind Ukrainian lines. Petro Mekhed, Ukraine's deputy defence minister, said separatist forces had been ordered to hoist their flags over both Debaltseve and Mariupol by Sunday. While that claim could not be verified, by Friday evening Life News, a pro-Kremlin and pro-separatist Russian tabloid, reported that rebel forces had entered the outskirts of the town. While Ukrainian military officials on Wednesday maintained that the road into Debaltseve remained open. “Logvino is under the control of the terrorists and Russian forces,” he wrote in a Facebook post, referring to a key hamlet on the road north east of Debaltseve. But Mr Semenchenko denied the separatists had sealed the “Debaltseve pocket,” saying the Ukrainians still have control of country roads and field tracks in and out of the area. The violence came as it was claimed Vladimir Putin had attempted to delay the truce by a full 10 days to allow the Russian-backed forces time to seize the town. Witnesses said the claims were made at summit in Brussels where Angela Merkel, the German Chancellor, and Francois Hollande, the president of France, briefed their fellow EU leaders on the marathon peace talks they brokered in Minsk. In Kramatorsk, where the Ukrainian military operation has its headquarters, there is little sign of the carnage being wrought just 50 miles away. But craters in city centre pavements and gaping holes in the walls of apartment buildings show the aftermath of a rocket attack that killed killed 17 and wounded 48 here on Tuesday. And there is a real sense that the next 24 hours could change everything. At the aerodrome that serves as the Ukrainian HQ, heavily armed guards were on high alert.